Is it just a fairing bolted on to the TNT300? Can it beat the KTM in the real world? Will it be a comfortable companion on those soul-searching rides to the Himalayas? 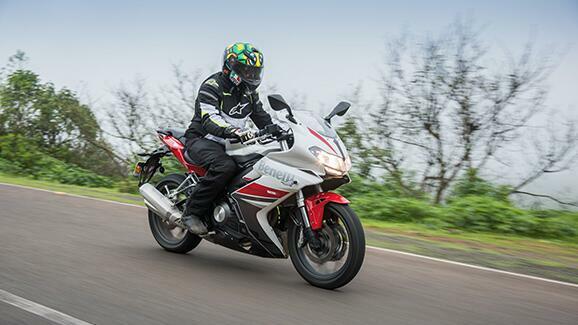 These and many more questions will be answered in the next 800 words as we subject the new Benelli 302R to some twisty B-roads, a mini hill-climb and long empty stretches of highway. But if you’re one of those impatient kinds who cannot be bothered with lengthy elucidations, here’s the gist of the story. This latest entrant to the faired quarter-litre clique is not exactly a sportsbike that can beat the KTM RC390 on a racetrack. But with a brand new chassis, it's the kind of a sport-tourer that will be easier on your backside compared to a Yamaha R3, for it's one of the most comfortable and user-friendly sport-tourers we’ve ridden lately. There you go, we hope this was helpful and it was great having you here. For those who still wish to be with us, thank you for being patient and now let’s dive deep into this little Italian steed. We’ll begin with what’s at the heart of the matter – the liquid-cooled, in-line twin that the 302R shares with its naked sibling, the TNT 300. Even with a change of application, Benelli hasn’t made sea changes to this unit, so power figures of 38bhp and 26.5Nm remain the same as the street fighter. Although these numbers are in the territory its rivals play in, its overall weight isn’t – 198kg of kerb, that’s 26 and 29 kilos more than the Kawasaki Ninja 300 and the R3, respectively. And that has a direct consequence on its overall performance. Just like the TNT, the 302 also believes in leading a peaceful life. Power delivery isn’t destructive and it loves to build up speed in a steady manner. It’s quick, mind you, it’s just not alarmingly fast. So all that power on paper doesn’t translate into overwhelming performance and to a certain degree, it’s the excessive weight to be blamed. That said, the motor is extremely tractable – building up speeds from 40kph in sixth is done with élan – and there’s a nice wave of power north of 7000rpm, where it feels the sweetest. The rpm needle will effortlessly reach for its redline of 11,500 and even at higher engine speeds, vibrations are within acceptable levels. It’s not just the refined engine, the super-slick six-speeder too complements the motor well, making for a fine mechanical package that we’ve grown to appreciate over the years. Plus, there's the 302’s exhaust note that makes for a fine companion on long rides. Okay, it's not TNT 300 good, but this one isn’t bad either. It sounds a bit gruffer than the street fighter, but it is nonetheless quite an addictive growl. Despite being a near 200kg motorcycle, the 302 feels relatively light on its feet once you gather momentum and directional changes are as you would intend. But it falls marginally short of excellence the RC390 and even the R3 display around the twisty bits. Also, wondering why the footpegs are set so notoriously low because when you lean hard into corners, they do tend to ruin the rhythm at times. And lean you will as the grip from the meaty Metzelers urge you to push things harder. Unlike the 300 which has a trellis frame, the 302 makes do with a steel tubular chassis with 41mm inverted telescopic forks and mono shock at the rear. And together, they bestow the R with one of the most comfortable rides in its class. Rough stuff is dealt with aplomb and doesn’t unsettle the tempo easily. Plus, the well-designed saddle makes life trouble-free on long rides. There's also switchable ABS, something the R3 misses out on and that’s a welcome addition. While stopping power is adequate, a sharper bite from the dual discs up front and a single rear set-up would harm none. Mechanically, the 302 is quite likeable, but what doesn’t work in its favour is this – the massive thing that’s wrapped around the fuel tank. Yes, there are some neat touches like the twin headlamps and the tidy windscreen, but the rest of it takes this Benelli back to the early ’80s. Not a good thing then, for it’s quite a modern machine with the kind of package it comes with and the disproportionate fairing doesn’t do justice to its overall impression. Since we’re well-versed with the TNT 300, we weren’t expecting the 302 to be a fire breather in the first place. And it doesn’t disappoint in that sense. The 302R isn’t about going bonkers from the word go. It may not be the quickest-accelerating motorcycle of its class, or the fastest. And, if crazy performance is what you seek from your sub-300cc steed, this isn’t the direction you should be looking at. The Benelli’s 300cc parallel-twin sure likes it beyond the 7000rpm-mark, but it doesn't come close to being labelled a wild animal. Just like the other Benelli stablemates, the 302R is a practical motorcycle that shouldn’t be ignored if you are taking that leap into the world of premium motorcycles. This faired 300 comes with a pretty strong mechanical package, rider ergonomics are well-sorted, offering a comfortable saddle-time, has good levels of fit and finish, and sounds much better than its rivals. At Rs 3.48 lakh, ex-showroom, Mumbai, it slots in right between the yet-to-be-updated R3 and the Ninja 300. So while it is quite evenly priced, it’s not the ideal small-capacity track tool its makers have been trying to convince us it is. It’s more of a sport-tourer and is quite good at being just that.